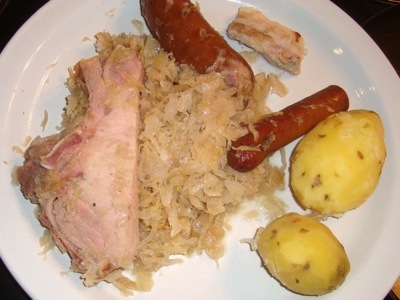 Wash well the Sauerkraut, press it to remove the excess water and then press in a cloth to remove more water. Spice bag: in a cheese cloth put the Coriander Seeds, the Juniper Berries, and the Garlic Granules. Mince the Onion and cut the Salted Cured Pork in slices (1/4 inch thick). 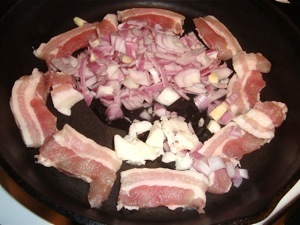 In a cast iron skillet put the minced Onion, the Duck Fat and the slices of the Salted Cured Pork. Heat at medium until the onions are very translucent. 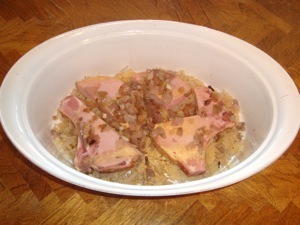 In an Oven Pan put at the bottom half of the Salted Cured Pork slices. Put on top half of the Sauerkraut and half the Onions. Bury in the Sauerkraut the Spice bag. Put over the Smoked Pork Shops and cover them with what is left from the onion. 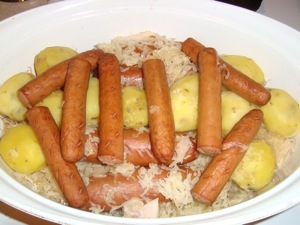 Cover with what is left from the Sauerkraut and cover with the Knackwursts (poke their skin with a knife). Pour the Wine and Chicken Broth. Cover and put in the oven at 275 for 1 hour 30 minutes. Peel the Potatoes and boil them for 10 minutes in water with Salt and Garlic Granules. Remove the Potatoes from the water and keep them aside warm. 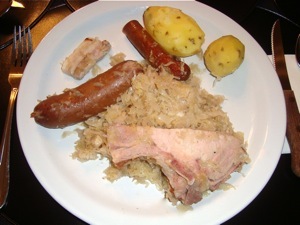 Remove the Choucroute from the oven and put the Potatoes on top. 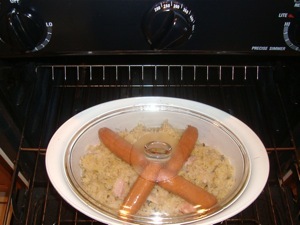 Cover and cook in the oven at 225 for 30 minutes. 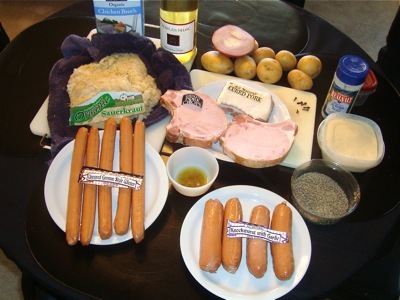 Put the wieners (poke their skin with a knife) 5 minutes in boiling water before serving the Choucroute. 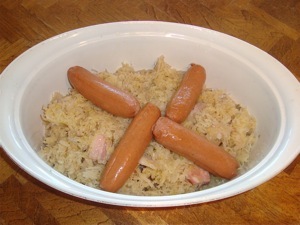 Note: You can let cool the Choucroute after cooking and keep it in the fridge. Reheat in the oven within the next 2 days at 250 for 30 to 40 minutes.